Canada’s national identity seems inextricably linked to landscape. Outsiders visualize our country as a vast unspoiled territory, and to an extent Canadians embrace and perpetuate this myth. Ironically, the majority of Canadians live in urban centres and only occasionally, if ever, access the remote wilderness. For many of us, the vehicles we travel in mediate our experience of the landscape. Scenery rushes by, viewed peripherally from metal and glass enclosures. Though we may glimpse swaths of vegetation, our landscapes are not comprised of lush foliage; we are confronted with a disruption of concrete structures surrounded by expanses of asphalt. In his most recent body of work, visual artist, Matt McInnes responds to the peculiarities of the urban landscape. 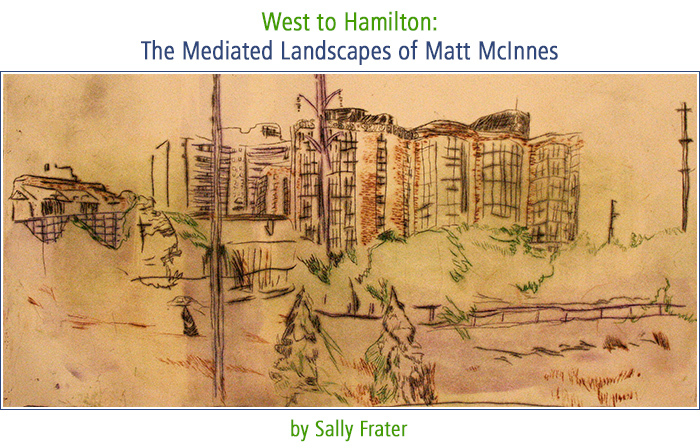 Working from a set of snapshots taken while travelling the QEW, McInnes has produced a series of drypoint prints titled West to Hamilton. His etchings record the confluence of matter, both natural and fabricated, that encompass the highway scenery between Toronto and Hamilton. In doing so, the artist joins a coterie of Canadian artists, most notably the Group of Seven, who take the landscape as the subject of their work.